ERZURUM, TURKEY. 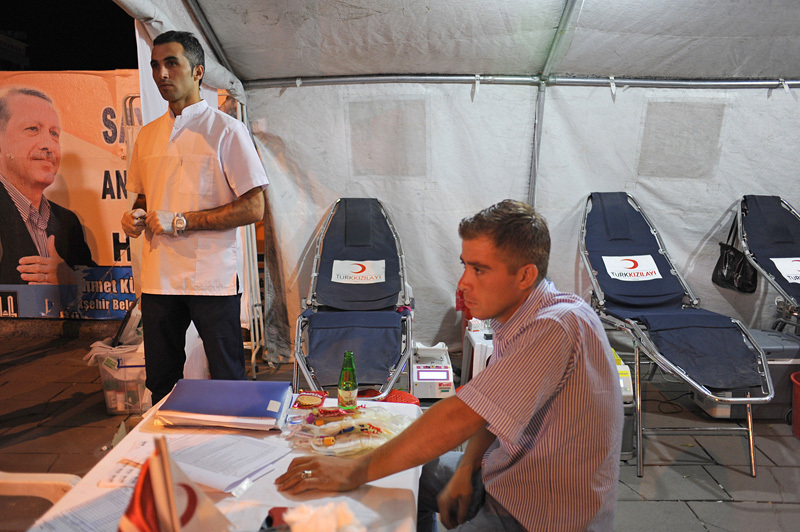 A male nurse stands over a man after giving blood at a blood drive organized by the Turkish Red Crescent in a tent on Cumhurriyet Road in Erzurum, Turkey, the first major city near the route of the Baku-Tbilisi-Ceyhan oil pipeline in Turkey, located just 10 kilometers from the pipeline which traverses numerous villages near the city's airport, on August 11, 2010, the first night of Ramadan. During the month of Ramadan, Muslims are encouraged to give Zakat or money for charity, one of the five pillars of the Muslim faith, and those who cannot are instructed to donate blood and perform other acts of charity.